Still often forgotten, “The Prettiest Star” remains, in its way, the last curse of the Sixties for Bowie: it was the early 1970 follow-up single to his Top 5 hit “Space Oddity” that went nowhere in the UK and wasn’t even released in the US. It was rarely performed live: never again after 1973. As always with the early stuff, this entry’s unfocused and sloppy at times, particularly in the music graphs. The book version’s better, I hope. I still like the Aladdin Sane version more. The Prettiest Star (Aladdin Sane remake). The Prettiest Star (live, 1973). “Space Oddity” gave David Bowie a hit single at last and he had no clue how to follow it up. He dithered for months, considering “Janine,” among other Space Oddity tracks. The decision finally came down to either remaking “London Bye Ta-Ta” (his manager Ken Pitt’s choice) or cutting a new song that Bowie allegedly had just written for Angela Barnett, who he’d marry in a few months. Bowie went with the latter and got his old rival/colleague and emerging pop star Marc Bolan to play lead guitar on it. “The Prettiest Star” was simple, hummable, sweet and reassuring: it sold less than 800 copies. Why did “The Prettiest Star” stiff so badly? Tony Visconti had warned about the danger of “Space Oddity”: it was such a dated one-off song that it threatened to consign Bowie into the bin of late ’60s novelties. Bowie resisted the obvious course, doing an SF-themed follow-up, but “Prettiest Star,” compared to “Oddity,” was quite square, its sentiments treacly, its tone warm and nostalgic. Many ’70s pop listeners would have a yen for those very qualities, but maybe March 1970 was a bit too soon. By the spring Bowie was recording heavy metal songs. “The Prettiest Star” has a basic verse-and-refrain structure, simple rhymes (“one day” with “someday”), dyslexic rhymes (“tried” and “tired”) and a pretty if unadventurous melody. There are a few tricks. Take the way the first three guitar notes serve as a count-in before the first bar of the intro, a pattern replicated before other verses by piano or strings. Or how in the first two verses Bowie stays on the C chord when it seems like he’s going to move up (“it can all but break your heart…in pieces,” “I moved up to take a place…near you”), only to break the pattern in the third verse, the chords moving to F and F7 as Bowie sings the title phrase. And the song’s other main part (the 10-bar section that begins “staying back in your memory“) is either a refrain or a bridge—it can serve either role. “The Prettiest Star” seems to offer a battle of two lead guitarists—Marc Bolan on the single, Mick Ronson on the remake—but comparison listening makes it pretty clear that Ronson ceded the field to Bolan. While some critics have claimed Ronson reproduces Bolan’s solo note-for-note, which isn’t quite the case I think, he comes pretty close (Ronson even plays a vibrato-laden chord against Bowie singing “HOW you moved” in the bridge, just as Bolan did). You can see why Ronson didn’t change it up: Bolan’s vibrato-saturated solo is one of the most melodic guitar lines he ever recorded, and it’s more memorable than Bowie’s vocal. In January 1970 Bolan only recently had switched to electric guitar (one reason he agreed to the Bowie session was that Visconti and Bowie had flattered his playing) and he plays the near-identical riff throughout the song, changing it only in the final repeat. Ronson, when he remade “Prettiest Star” in late 1972, had his own well-established sound—plug his Les Paul directly into a cranked-up amp (occasionally using just a single wah-wah pedal), and, like Jimmy Page, use precise overdubs to fatten out the track (here he puts in a scratchy, distorted second guitar at the end of the intro). Bolan’s lead had been supplemented by Bowie strumming on 12-string acoustic guitar, but Ronson has no need of that, as saxophones serve to beef up the verses, freeing Ronson to craft metallic washes of sound. It’s unclear why Bowie remade “Prettiest Star” for Aladdin Sane: perhaps he was short of new material (this was when record companies wanted artists to churn out new LPs seemingly every nine months—today, Justin Timberlake gets half a decade between records) and for most record buyers “Prettiest Star” was basically an unreleased track, given its awful reception in 1970. If the original version of “Prettiest Star” was a simple valentine, the remake is a rowdy, garish engagement party, with doo-wop backing vocals, a horn section, an aggressive piano and a heavier beat. They both have their appeal, though the Aladdin Sane edition sounds like a better time. 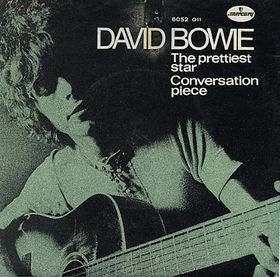 Recorded 8, 13-14 January 1970 (with Visconti on bass and Godfrey McClean on drums) and released in March as Mercury MF 1135 c/w “Conversation Piece”—the same group, including Bolan, also cut “London Bye Ta-Ta” but it was left on the shelf; the Aladdin Sane remake was recorded in New York between 3-10 December 1972, in one of the first sessions for the LP. 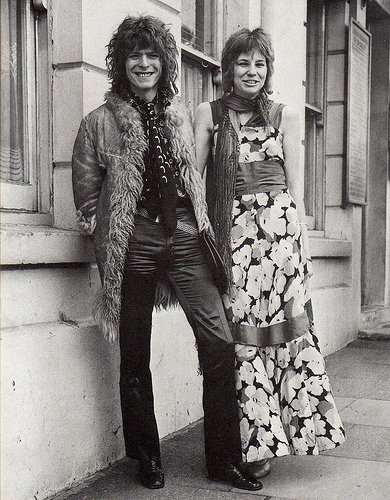 Top: The Bowies wed each other, Bromley Registry Office, 20 March 1970. This entry was posted on Thursday, January 21st, 2016 at 1:00 pm and is filed under Philips/Mercury Years: 1969-1970. You can follow any responses to this entry through the RSS 2.0 feed. Both comments and pings are currently closed. It’s my least favorite track from Alladin Sane. This album really is a night and day thing. Some of the most boring bowie stuff from the ’70s (Prettiest Star, Let’s spend the night together,Jean Genie) and some of his best tracks from the ’70s (Alladin Sane, Time, Cracked Actor and Lady Grinning Soul). At any rate the AS cover foto/painting is just pure magic. I like this song, but not sure why he’d choose this over John, I’m Only Dancing for Aladdin Sane. Or, take another stab at All The Young Dudes. Thank you for the reissues, Chris. Mmm never heard the original before, at first seems slower and less somehow. Except for that guitar. I was a fan of Bolan way before Bowie, first single I ever bought “Telegram Sam” at age 6. On reflection, and after several listens, I think the single version has lots going for it if only the strings could be faded in the mix a bit. David’s vocal is great too, I love the way he sings “takes” whereas the delivery of “Staying back in your memory” harks back to pre Space Oddity (lp) days. I agree it’s an odd fit on Alladin Sane though. I don’t think a new version was really necessary, but I like it anyway. It’s a simple lovely song I should revisit more often. When I first heard the original, I immediately understood why he would want to remake it. Not sure why, but Bowie’s singles before Ziggy were either masterpieces, or sound like demos. The Prettiest Star single sounds like a demo. There’s an inspired seed there, for sure, but it wasn’t until 73 that the magic of the song was unlocked. I adore the remake. Aladdin Sane was in many ways an amplification of everything that Ziggy hinted at, and while Cracked Actor offered nihilistic crunch, and Time was the apotheosis of glam cabaret, this was the gushiest of pop gems. An underrated classic, I’d say. Everything I was gonna say, s.t. said first! This is right on. Spot on. I love the AS remake, as you say an underrated classic. Another concurrence here. In fact this is one of the songs I was able to listen to right after January 10th … something soothing and joyful about it. It just popped into my head and I had to hear it again. One of the highlights of the album. Hey, don’t apologise for early blogs. That’s the beauty of the development of blogging. And thank you so much. I discovered your blog several mo the ago via the George Steiner link. Space Oddity followed by The Prettiest Star… a bit like the Penny Lane/Strawberry Fields Forever single. The original Prettiest Star sits between all chairs, I think. Not quite rock ballad, not quite psychedelia, Bowie not quite finding his voice, and just a small hint of too little material stretched too thin. Yet, there’s some innocent charm in it. The Aladdin Sane version then blew those faults away by queering it up a little. Prettiest Star was for me always the closest thing to a dud on Aladdin Sane. I didn’t realize how well-constructed the song is until I heard Ian McCulloch’s cover from 2002 or thereabouts, my preferred rendition of the track. His croon gives the song a new depth of sadness that Bowie’s more winsome approach can’t compete with, on either of his recorded versions. (It’s like McCulloch is getting the song out that he always heard in his head as a young Bowie fan.) Which is the better DB recording? I would agree that the AS take is tighter and better-sounding, but I really like Bolan’s work on the original. I should add that a dud relative to the rest of Aladdin Sane is still pretty damn good by most people’s standards, of course. prob. not new, though; most likely a series like the Dylan Bootleg Series if anything. Still and all, that means more grist for the ol’ PAOTD mill; the punters will be pleased. Chris has become Sisyphus, eternally reaching for a final Christmas list that he will never reach. Bowie is pushing ahead of him even from the grave. My preference would be for one multi-disk official release only – basically the same approach as Nothing Has Changed, giving us a career spanning retrospective but of the best songs from the vault. Curated by Bowie or Tony, Barnbrook art. Anyway, I’ll take what i can get. I bet he recorded dozens of songs between Reality and The Next Day. Does anyone know a good place to download Toy? Is the Bolan version of London Bye Ta Ta available anywhere? it’s on the original Sound + Vision set, i think. Hate to go terribly off piste here but can someone with a thorough knowledge of Bowie please go to Mark Saunders’ YouTube post and debunk his totally phony “Bowie impersonates Springsteen” clip? It’s obviously not David Bowie singing and so many fans are falling for it that it will damage his reputation. I think that is him, it’s certainly his voice in between the imitations, and he’s talking about doing the imitations, so … not sure why you’d think it was a fake? His imitation of Iggy is actually quite good. Same with Springsteen. The man was a funny dude. Why wouldn’t it be Bowie? that’s him. i don’t know why you think it’s not. nor does this damage his reputation in the slightest. Bowie does a great Iggy impersonation elsewhere, he slips into an outright impersonation partway thru the sister midnight cover on the Reality tour DVD. hiatus = I don’t write about David Bowie at all. But those things also don’t really interest me, sorry.